The pitch for this formulaic but fun animated comedy from Illumination Entertainment (the production outfit responsible for the Minions) must have sounded like the world's biggest no-brainer: it's basically X-Factor, but with animals. It's certainly a winning idea and British writer-director Garth Jennings (Son of Rambow) and his co-director Christophe Lourdelet have assembled a note-perfect voice cast, but you can't help wishing a bit more thought had gone into the script. Matthew McConaughey voices koala impresario Buster Moon, a hustler-slash-dreamer who comes up with a plan to save his ailing theatre by staging a singing competition. However, a slip-up by his wonky-eyed chameleon secretary Miss Crawly (Jennings) results in two extra zeros being added to the $1,000 prize money, which brings a city's worth of aspiring vocalists to his door. 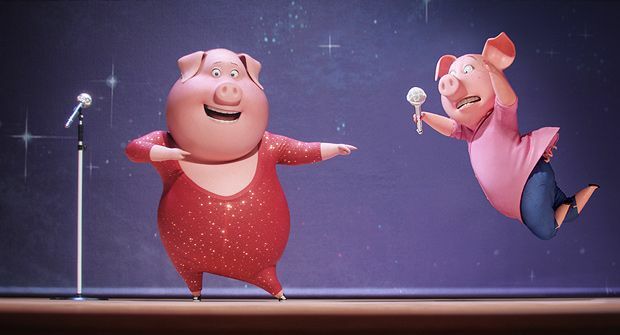 These include: Johnny (Taron Egerton), a gorilla from a family of bank robbers; punky porcupine Ash (Scarlett Johansson), desperate to escape the shadow of her singing partner; put-upon pig Rosita (Reese Witherspoon), who's rushed off her feet with her 25 kids; and tiny crooner Mike (Seth MacFarlane), a mouse with a Sinatra-like voice and a giant ego to go with it. A large part of the film's humour and appeal comes from the amusing juxtaposition of cute critters singing familiar, and occasionally inappropriate, pop songs – such as a trio of bunnies doing 'Baby Got Back', or a timid sheep belting out 'Kiss From a Rose'. To be fair, Jennings packs in some decent gags, both visual and verbal, but the plot is simply too thin to sustain the 108-minute running time and there are no real surprises, with each character's sub-plot playing out exactly as you'd expect. While it lacks the sophistication and inventiveness of, say, Zootropolis, Sing's adherence to convention at least ensures that it offers predictable pleasures and ticks all the required feel-good boxes. If you're a fan of singing shows and are fond of cartoon animals, you are unlikely to be disappointed. General release from Fri 27 Jan.
Koala impresario Buster Moon (McConaughey) decides to save his ailing theatre with a singing competition. Most of the humour comes from cute critters singing occasionally inappropriate songs; the plot is spread far too thin and there no real surprises, but it ticks the usual boxes.